Was my title too corny? I couldn't help it, as I sit here tapping my foot to InDeep's "Last Night a DJ Saved My Life". I kind of live for that low disco throb anchoring the track. It's so sweet that I had to find a way to incorporate it here as an expressionist at work. 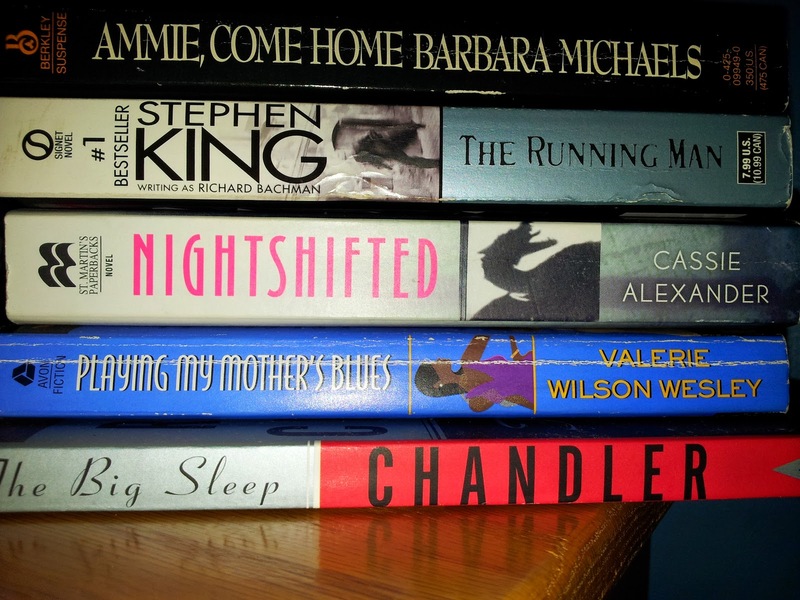 It's been a challenging–and I mean challenging–reading month. I started off strong, finishing the fourth book in Martha Grimes' Emma Graham series (who I still miss). I then managed my way through the fourth book in Sara Paretsky's V. I. Warshawski series, Bitter Medicine. I enjoyed my time with Elizabeth Peter's Jacqueline Kirby in her English country house mystery adventure. And without a doubt Rita Mae Brown's Mrs. Murphy feline detective series gave me the warm and fuzzies in its third offering. Then I stopped by Barnes & Nobles one day after work and picked up the recent release of Patricia Cornwell's Kay Scarpetta series, Flesh and Blood. That's when the high-flying fantastic reading hit the fan. Between dealing with health insurance madness and a cell phone battery that just wouldn't (thankfully, my replacement came in about forty minutes ago), I just kind of let the rest of this month go all together. Even my blog suffered! I kind of got through by watching Golden Girls, playing Tales of Xillia 2, and fitting in a short story/manga or two to keep me reading. However, all personal stuff aside, let's get back to how I abandoned the 22nd book in Cornwell's Kay Scarpetta series! Or better yet, be on the look out for my review. Nonetheless, I'm here to share a few of the recent acquisitions I've gathered through the month of November. Because if I wasn't reading books, I was buying them. Seeing that Emma Graham was coming to an end, I frantically searched for something similiar to take her place (at least until Mrs. Grimes writes the fifth book). I didn't want to let twelve-year-old Emma's voice go after Fadeaway Girl. So I am happy to say that I discovered Alan Bradley's Flavia de Luce series immediately following. Flavia de Luce is a ten-year-old girl detective; and where Graham's series takes place in 60's US, Luce's is 50's UK . So we have era and adolescence all spinning in the same vein of detective fiction. I only hope Flavia is as witty, clever and smart-mouthed as Emma. And despite all those hopes, I trust that she's a different girl all together. I did a video where I talked about how I'm unable to jump right into the middle of a series with any kind of comfort. I must start from the beginning and work my way down. In that video, I related my owning book three [Blanche Cleans Up] in Barbara Neely's series about a black housekeeper who solves mysteries. The series has been on my radar for years, but I've only owned the third book. After watching the video again, I realized I had no excuse for not starting Blanche's story. So, I finally ordered the first book, Blanche on the Lam. 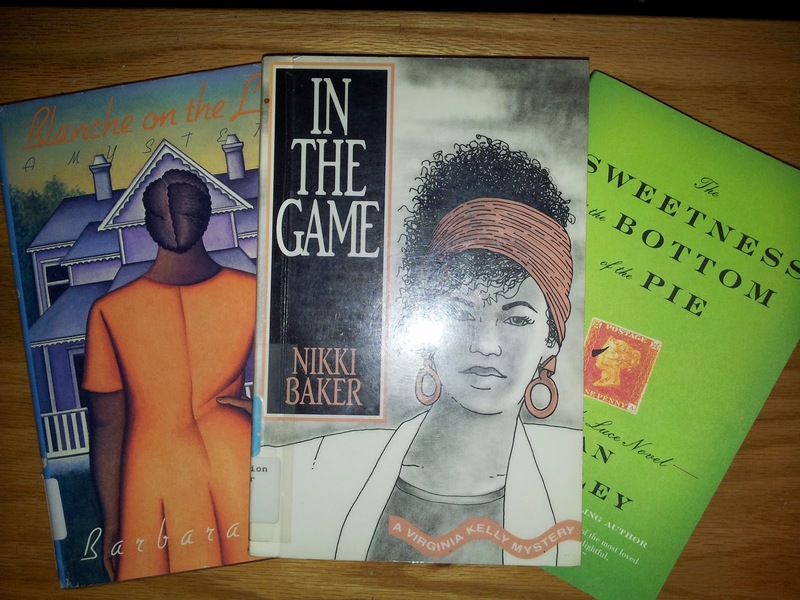 More on detective fiction, black women, series, and radars comes In the Game by Nikki Baker. We're going to double (or even triple) minority realms here. You see, this series not only revolves around a black woman named Virginia Kelly, but she's also a black woman who happens to be a lesbian. My radar was buzzing with this series for quite some time, and I finally got my hands on the first book, In the Game. Rumors has it that Virginia Kelly has a nasty attitude as she goes about solving murders in Chicago's lesbian community (or further out). From my understanding, said attitude has turned some readers away. We'll just see about that. As most of you know, I'll be the first one to tell you about it. This is certainly not my first foray into Korean-American author Chang-Rae Lee. I was first introduced to him through his debut, Native Speaker. Native Speaker was somewhat of a frustrating read for me. Its context, concerning a Korean-American's alienation from Americanized concepts of culture, attitudes and behaviors, was the best thing ever. I got the purpose (exchange that with any other word) of the book. However, while that's all true, I also felt like shaking Lee's character, Henry. It's all filled in his narrative, but man did he make a mostly inexpressive and sober narrator. Long story short, recently Chang-Rae Lee popped to mind. I researched his publications and decided on The Surrendered as my second take. 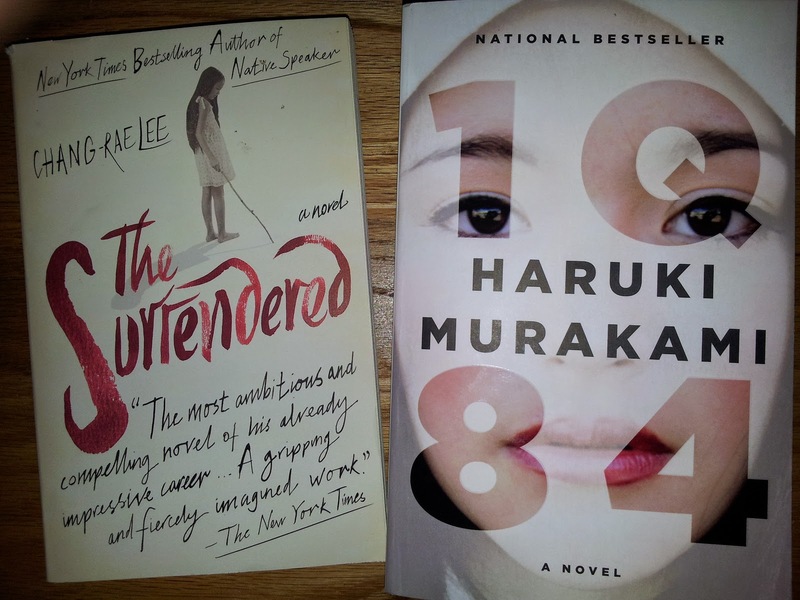 My coming to 1Q84 by Haruki Murakami is almost a direct reflection of my coming to The Surrendered by Chang-Rae Lee. Both authors I read years ago and, for no imaginable reason, held back from until recently. The difference is that I, like many, seemed transfixed by the length (and maybe even cover) of 1Q84. It's always been on my radar, screaming "buy me read me" since its release. I suppose I was hesitant because of its size. Nonetheless, I read (as well as discovered) Murakami's Dance Dance Dance years ago, finding myself more or less gripped to the author afterwards. I gave him a try, and that was that. So here's to attempting 1Q84. Because it's three books combined into one, my plan is to take them one book at a time. 1157 pages begs to be piecemealed. December should not be like November–or even October for that matter. I want to just let these last few days in November idle on by before I decide which book on this list will break open the final sprint of 2014! With that said, happy reading everyone. If you've read any of these books, please use the comments section to share your thoughts. I'd love to hear them.